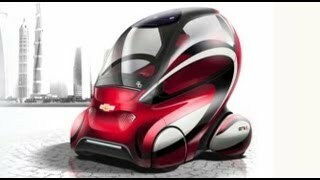 Chevrolet EN-V Concept is a zero-emissions vehicle powered by lithium-ion batteries, which would allow the car to travel 40kms on single charge making it very convenient for city driving. The EN-V Concept will add new features that customers need, such as climate control, personal storage space and all-weather and road condition operation while preserving key elements of the original EN-V, such as the small footprint and maneuverability. It will also retain its battery electric propulsion, connectivity and autonomous driving capabilities. DETROIT – Work on the next-generation EN-V concept vehicle, representing General Motors' vision to meet the growing demand for safe, connected, zero-emissions personal transportation could participate in pilot demonstration programs in megacities around the world to determine real-world practicality. In addition, future EN-V concepts will carry a Chevrolet badge, Chris Perry, vice president, global Chevrolet marketing and strategy, told media on Wednesday in advance of Chevrolet's Nov. 3 centennial celebration. "For 100 years, the Chevrolet brand has been focused on making advanced technology that improves customers' lives accessible and affordable, and the Chevrolet EN-V will continue that tradition," said Perry. "By 2030, more than 60 percent of the world's 8 billion people will live in urban areas," said Perry. "The Chevrolet EN-V represents a possible solution for global customers living in markets where alternative transportation solutions are needed." The award-winning Chevrolet EN-V, short for Electric Networked-Vehicle, is a two-seat, electric urban mobility concept that maintains the basic principle of personal mobility – freedom. One of the stars of the 2010 Shanghai World Expo, EN-V was designed to address environmental issues and help alleviate traffic congestion, parking, safety concerns and energy consumption. The next-generation Chevrolet EN-V concept will add new features that customers need, such as climate control, personal storage space and all-weather and road condition operation while preserving key elements of the original EN-V, such as the small footprint and maneuverability. It will also retain its battery electric propulsion, connectivity and autonomous driving capabilities. "The Chevrolet EN-V has the potential to reinvent transportation in key markets by creating a new vehicle DNA through the convergence of electrification and connectivity," said Chris Borroni-Bird, GM's director of Advanced Technology Vehicle Concepts. "It provides an ideal solution for petroleum- and emission-free urban transportation that is free from congestion and crashes, and more fun and fashionable than ever before,"
In April, GM and the Sino-Singapore Tianjin Eco-City Investment and Development Co. Ltd. (SSTEC) signed a memorandum of understanding to collaborate on integrating the next-generation EN-V into the Tianjin Eco-City from a power, communications and physical infrastructure perspective. Borroni-Bird said Chevrolet will explore other locations around the world – including the United States – for potential pilot programs. 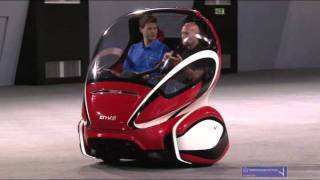 The EN-V is a zero-emissions vehicle powered by lithium-ion batteries. Recharging from a conventional wall outlet using standard household power allows EN-V to travel at least 40 kilometers on a single charge, an acceptable range for most urban trips. By combining GPS with vehicle-to-vehicle communications and distance-sensing technologies, the EN-V can be driven manually or autonomously. 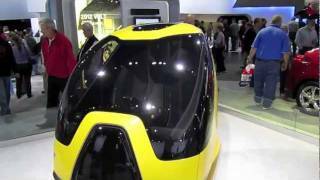 In autonomous mode, EN-V offers mobility to people who may not otherwise operate a vehicle. By leveraging wireless communications, it allows drivers and occupants to communicate hands-free with friends or business associates while on the go. The ability to communicate with other vehicles and with the infrastructure could help EN-V significantly reduce the number of vehicle crashes and make it easier to find available parking spaces. It could also reduce traffic congestion by automatically selecting the fastest route based on real-time traffic information. "This technology platform of electric propulsion, sensors, wireless communications and GPS-based navigation is likely to migrate from the EN-V concept to other automobiles and could lead the way to safer, cleaner vehicles in the future," said Borroni-Bird.